The Navarra Quartet enjoys an international reputation as one of today’s most dynamic and poetic string quartets. Prizewinners at competitions in Canada, Australia and Italy, their line-up includes Irish cellist Brian O’Kane. They will play one of Haydn’s charming yet sophisticated early quartets, Latvian composer Peteris Vasks’ richly atmospheric fourth quartet and Schubert’s epic, monumental G major string quartet. Formed in Bucharest in 1995, Galway’s Ensemble in Residence since 2003 and RTE’s Resident Quartet since 2013, the multiple award-winning ConTempo Quartet is Ireland’s longest established string quartet. They combine performance of the classical quartet repertoire with a strong commitment to Ireland’s composers, presenting works by Jennifer Walshe and Linda Buckley in this series, alongside works by Haydn and Brahms. The versatile and award-winning Anglo-Irish Carducci Quartet was founded in 1997 and has won numerous international competitions, including the Concert Artists Guild Competition 2007 and Finland’s Kuhmo International Chamber Music Competition 2004. Their Naxos recordings of Philip Glass’ Quartets have had over six million plays on Spotify and they will play his popular third quartet in this programme alongside two classical masterpieces – Beethoven’s early, stormy, C minor quartet, and Mendelssohn’s late, tragic, F minor quartet. Donnacha Dennehy’s intriguing ‘Pushpulling’ from 2007 completes a compelling programme. The ConTempo’s Haydn and Brahms journey continues with Haydn’s glorious, uplifting ‘Sunrise’ Quartet and Brahms’ third quartet - wonderful music which continually challenges the players to create a soundscape bigger than a string quartet but yet which ‘truly sounds like the work of a man on his summer holiday. Especially in its outer movements there is a feeling of the countryside, of sunshine’ (Misha Amory). 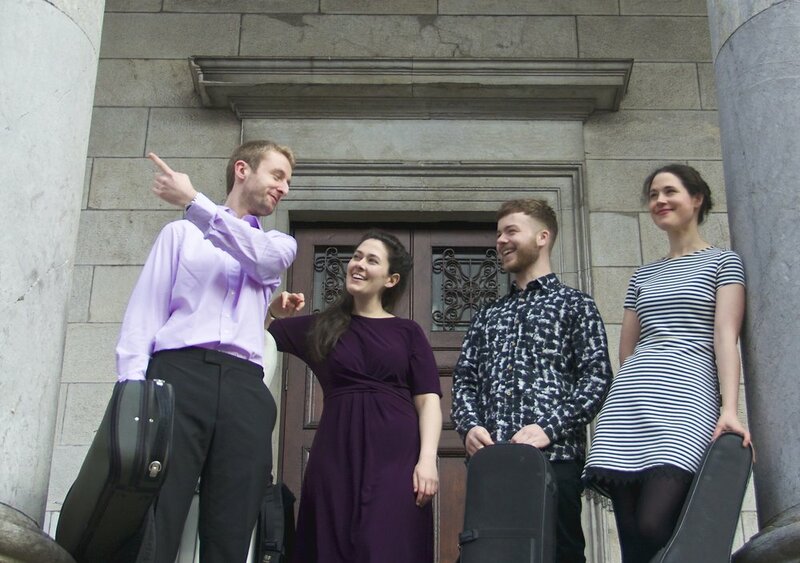 Four of Cork’s brightest musical stars have come together as the Shandon Quartet and bring a wealth of talent and experience to this delightful programme. Haydn’s 62nd String Quartet, ‘Emperor’, abounds with charm and vitality, incorporating folk dance rhythms and some stunning virtuosity. Raymond Deane wrote his quartet Embers in 1973 when he was only twenty years old and it remains one of his best loved works. Schumann’s third quartet is lyrical, dramatic, full of conflicting emotions and abundant in beautiful musical references to Clara, his wife. The Esposito Quartet comprises four of our most distinguished musicians with a combined wealth of experience as recital artists, orchestral leaders and teachers, whose common love of the quartet treasury brought them together in 2010. Their programme includes one of Boccherini’s joyous quartets, two short gems by Shostakovich including the wonderfully silly Polka, rising composer Sebastian Adams’ second quartet, and the great 1877 G minor quartet by Grieg, which, he wrote, ‘aims at breadth, to soar, and above all at a vigorous sound for the instruments for which it is written’. Founded for Barry Douglas’ 2017 Clandeboye Festival, the Lir Quartet is one of Ireland’s most exciting chamber groups. Their programme includes Debussy’s lyrical, sensuous string quartet and a stunning new work by Donegal composer Sean Doherty which weaves traditional and classical together in a captivating musical tapestry. They will finish with Beethoven’s third ‘Rasoumovsky’ Quartet, renowned for its fearsome virtuosity.